I rented a 1.5 Mastercool Vacuum Pump and connected both Low and High Ports to the Manifold Gauges. I then opened up both valves and then turned on the vacuum pump....I am not seeing the needle go into the Hg range - stuck on 0. BTW - these are brand new gauges FWIW. Does this mean that I have a massive leak or does it take more than 30 minutes to get the needle to make some progress? Did you open the inlet valve on the pump? 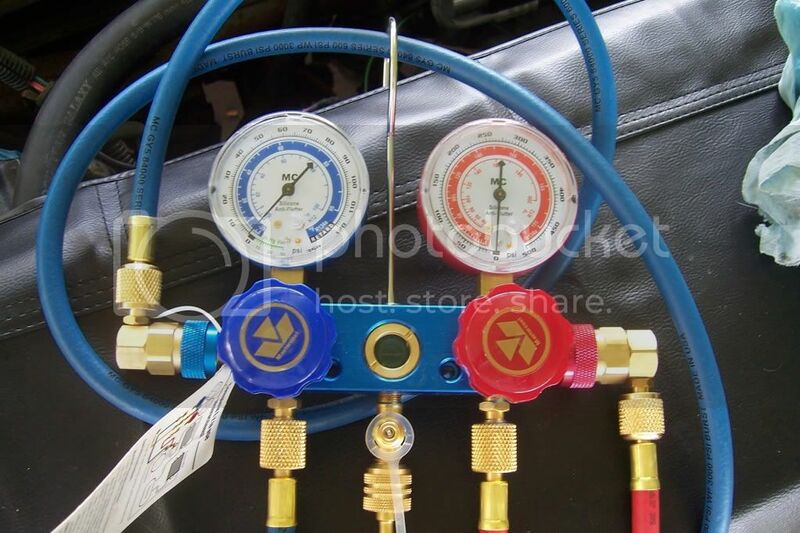 Connect the car fittings to the blank stubs on the back of the manifold and make sure you can pull vacuum on just the gauges and hoses. Inlet valve? This is the single stage version of the 1.5..not sure. Also, my manifold gauges don't have ports on the back of it. They do on the sides but no threads on those to screw onto. Make sure the exhaust vent on top (could also be an oil fill port, on some models) is open. Sometimes they are capped with a plastic or rubber piece. Make sure you have the correct level of vacuum pump oil in the sight glass. Make sure the valves on your manifold are open (including the middle charging/evac valve, if applicable). Make sure connections are snug. If you have two intake connections on the pump, make sure one is either capped, or both have hoses running to the system. Gas ballast should be slightly open on startup to eliminate any moisture within the pump, and then close it after a couple of minutes to create a better vacuum. 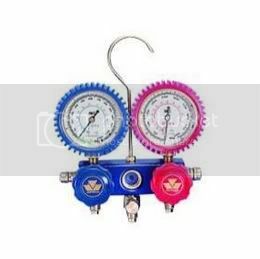 What MK is referring to, is some gauges have blind flare connections on the back that are only meant for hanging your hoses. 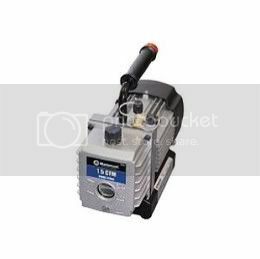 If you connect your vacuum pump to the middle port, and then connect the high/low hoses to the blind connections, you will pull a vacuum through all hoses and the manifold, and will be able to verify your vacuum pump operation before connecting to the system. It shouldn't take more than a few seconds for the needle to move into negative values on a small automotive system. This is why it's best to pressure test with dry nitrogen before throwing a vacuum pump on the system. With a vacuum pump, you will draw in atmosphere if you have a leak, and basically you're just circulating moisture through the system if you leave the pump running. Plus, it's way easier to find a leak with 200psi nitrogen spewing out of a small hole, than waiting for around -15psig to come back up to zero. The black cap in the second pic below is supposed to be off correct? If I put the cap on I will get Hg immediately - but I thought it is supposed to be off. That little black cap hanging off the pump should be tightened down. The bigger black cap should be off the pump, IMO. The cap labelled "oil" should be taken off. It doubles as the exhaust vent. When you use the pump, it will consistently exhaust gas through that port as it pulls and maintains vacuum. The inlet tee on that pump is designed for two hoses to be connected at once. Kind of like if you were to connect the high and low side on your car directly to the vacuum pump, without using manifold gauges. 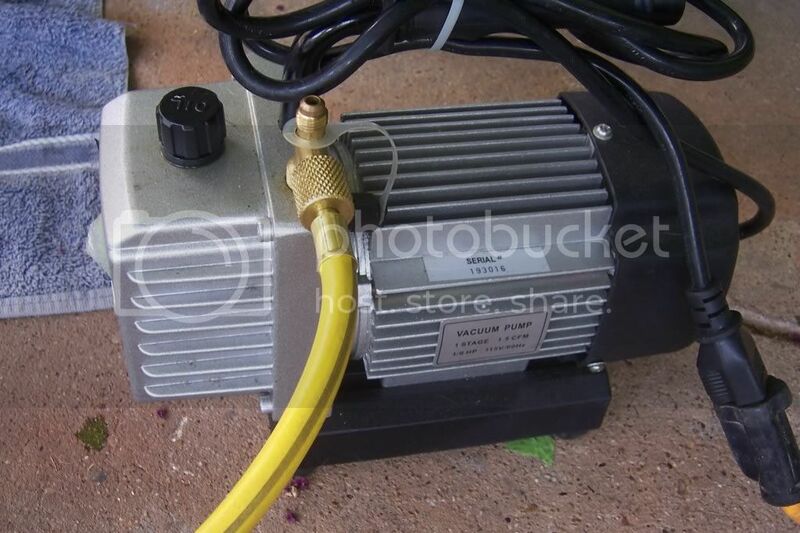 If you're only going to use one hose to the vacuum pump, put that small black cap on the other connection tightly. Or else all you're doing is drawing air through that second connection. Kind of like you're trying to pull the room you're standing in, into vacuum - you'll never pull past 0psig (atmospheric pressure). Also, any unused flare connections on your gauges should be capped off. Schraders are great at keeping pressure in, but I've found sometimes they can let small amounts of gas by when the other side is pulled to deep vacuum. Throwing on a 1/4" flare cap is a quick way to ensure you'll pull the best vacuum possible. My Hg gauge is showing halfway between 20 and 30 - so 25 - for an hour. I closed the valves for 10 minutes and it held steady. I am vacuuming again now. Do I need to be concerned that it is not all the way to 29.9? Do you have the right amount and type of oil in the pump? You should eventually (within several minutes) get the same full vacuum reading connected to the car as you do with the hoses blanked off. Definitely put a cap on that unused port in the tee on the center fitting in the manifold with the yellow hose. I borrowed the pump from the Zone so I am assuming it has the right and amount of oil in it. If you look at my first pic you can see that the needle is a little "high" on the Zero mark. Maybe this "highness" is causing my HG to show less???? reads zero. Of course you have to unscrew the plastic faceplate. that black cap labeled "oil" should NOT be removed. It must be screwed hand tight. The exhaust is out of the handle. my bad, sorry. I've never seen a vac pump with a handle exhaust before. I was going to say that. I have the Mastercool 1.5 pump and the exhaust is out of the handle. Also, my oil cap doesn't screw on. It just pushes on. There is a ball bearing and a spring under it. To check the pump oil, just make sure it's on the full mark on that sight glass on the front of the pump.